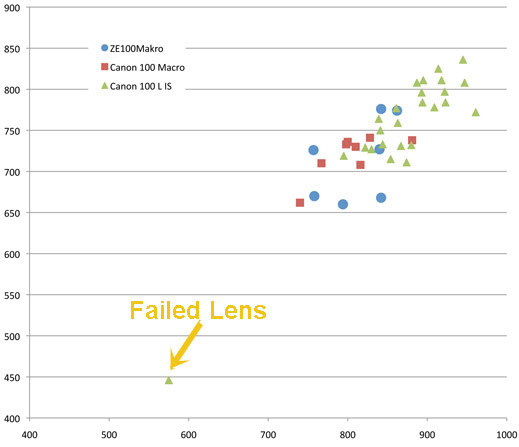 Roger Cicala of LensRentals.com has completed the second part of his two part series investigating lens testing. “My first thought when seeing more variation than expected was our testing methods weren’t accurate. So we refined testing methods, eliminated bad copies, and tested only new copies. The variation was still there. In the second part: “There is No Perfect Lens Test, Either”, Roger compares testing using Imatest to the expensive optical bench. He makes some valid constructive criticisms about how a variation in SFRplus region selection can lead to different reviewers having a variation in their test results. Roger also writes about how chart quality can be the limiting factor for measurements, and the importance of testing multiple focus distances. Roger concludes that while he will use Imatest for the majority of his testing needs, he will continue use his optical bench for testing wide angle lenses, and for testing lenses at infinity. Highly barrel-distorted (“fisheye”) wide-angle lenses can be tested with pre-distorted SFRplus test charts, and lenses can be tested at large virtual distances (up to infinity) using conversion optics (collimators) with high precision (typically chrome-on-glass) SFRplus test charts. This enables manufacturers to test longer focus distances in factory environments where space is limited. Be cautions when selecting collimators since their optics may degrade the measurements: some systems on the market were designed for NTSC TV systems (a far cry from high resolution digital cameras). How do test chart measurements compare with measurements at infinity? This brings up the important question, what is the effect of finite focus distance?, i.e., how do results differ from infinity focus? To answer this, we first note that it’s the relative distance— the distance to the chart divided by the lens focal length (and not the absolute distance)— that counts. 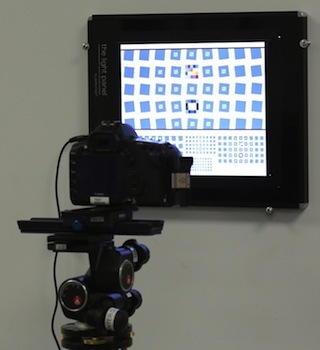 The relative distance is closely related to the image magnification, which is function of the test chart and image sensor size; magnification doesn’t change much with lens focal length because the distance to the target is roughly proportional to the focal length. According to Wikipedia, magnification (for a simple lens) is f/(f–do), where f is focal length and do is the distance from the lens to the object. For the above example, magnification would be 14/(14-36*25.4) = 0.0155 ≈ -1/64. This would remain fairly constant for lenses with different focal lengths. Schneider Optics provides the Rosetta Stone for answering the question. The key page is Nomenclature, which defines two obscure parameters shown in their MTF data sheets. 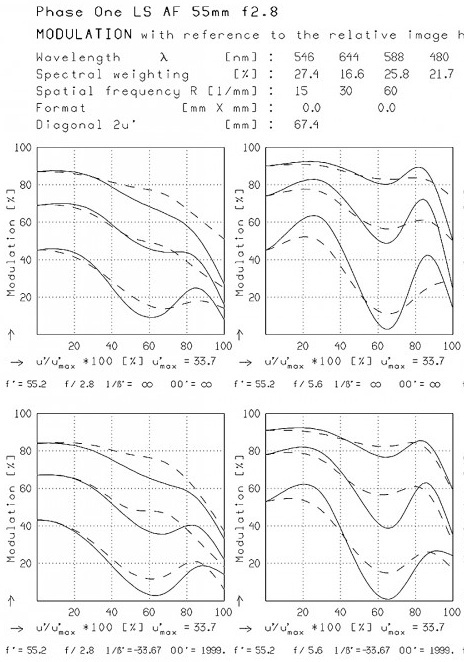 The plots for 1/β’ = 1/magnification = ∞ and -33.67 are very close, only differing beyond 90% of the center-to-corner distance (≥90 on the x-axis). This provides strong evidence that Roger’s test, with 1/magnification ≈ -64, should provide results reasonably close to infinity. 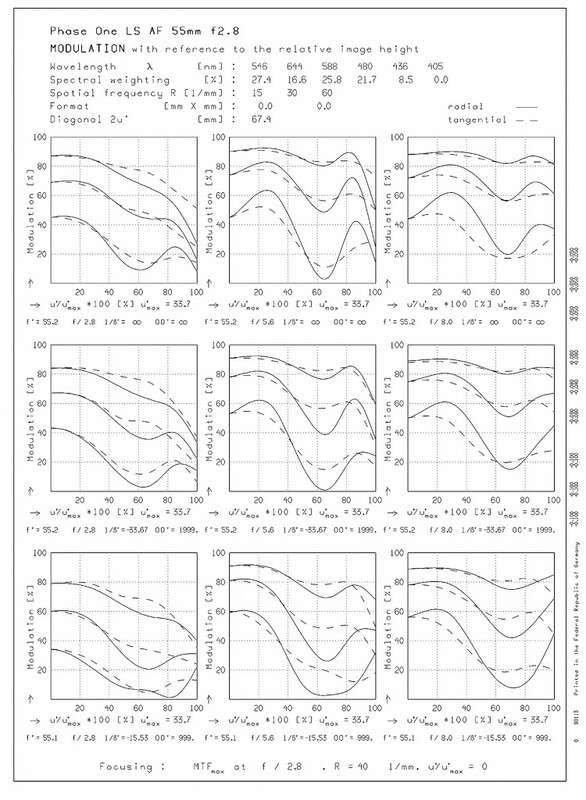 Other plots on the Phase One page show a significant change in MTF for |1/β’| = -20 or less. (β’) of 0 (infinite distance) and 1/33.67. Click on the image for an uncropped full-size image.